Ask fellow campers about "Limon KOA" and nearby attractions. It's not fancy, but it's clean. We had a pull-thru site, long enough for our 31' RV plus toad. Staff was friendly. Sites are gravel. Long grass strip good for walking dogs, complete with waste bags. Good for a 1 or 2 night stay. We camped at Limon KOA in a Motorhome. had to pay a private campground since you can't stay overnight at a walmart near Denver. This was very expensive for just a place to park, but it did the job. We camped at Limon KOA in a Motorhome. Close to I70. Sites are close. Satellite friendly. Streets easy to navigate. Sites and streets freshly covered with a kind of gravel/oil/dirt combo. Cuts down on dust. Hookups convenient. G00d place for an overnight stop. We camped at Limon KOA in a Motorhome. Got a pull thru with electric and water. Long enough for my 42 ft MH with tow. Ck in was quick (I reserved on line). The park is clean and well laid out. Perfect for 1 or 2 nights. Employees are very accommodating. We camped at Limon KOA in a Motorhome. This is a so-so KOA that is a good place to get some sleep as you go somewhere else. To give them some credit, we arrived at 7:00 pm with no reservation and they had a back in site available. My main complaint is they charged me $42 for a site worth $25. The site marker posts were not installed deep enough and several are laying on the ground. Keep this in mind if looking for your site. If you make a reservation for a pull through, you would probably do better. They were in the middle of paving the roads and sites when we stayed so there were piles of asphalt or dirt here and there. It is quite windy here and a burn ban was in effect. The dog park was big enough to play fetch. When approaching the dog park, look left and right to ensure no one is pitching horseshoes. On this note, my Dad is the only person I've ever seen pitching horseshoes while camping. They did have a pool that looked clean. I would probably look for somewhere else if in the area again. We camped at Limon KOA in a Motorhome. We stayed here overnight, got in around 8pm and back on the road at 8am. 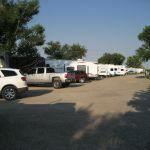 The campground is convenient to the interstate, easy to get in and out. They have a nice dog walk area, with many other fun activities like a pool, horseshoes, volleyball, playground, game room. Like a typical KOA it is a bit overpriced for just an overnight spot. The electric was clean, water pressure was high so you need a regulator. They do deliver pizza to your campsite if you wish. 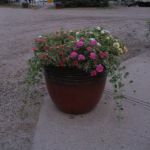 The best thing about our stay was that the site was long enough for both my fifth wheel and truck so I did NOT have to disconnect. We camped at Limon KOA in a Fifth Wheel. We didn't have a reservation and arrived at the park 20 minutes before their usual check-in time, but the lady that answered the phone said she would be right there to check us in. We had a very convenient and lengthy pull thru with 50 amp and water (no sewer because I requested it to save $$) The pool was great and laundry room was convenient. $2.00 or $2.50 for washers and $2 for dryers. The laundry was very clean and cool, which was great because it was very hot outside. The managers were very friendly and happy to oblige. We had the pancake breakfast the next morning and I mentioned one thing that needed attention and the manager jumped up and thanked me for calling his attention to it and took care of it. It was nothing they had any control over. There are very few parks along I-70 between Kansas and the Co plains that had a pool, and that's why we chose this park. It was extremely windy at night, which they had no control over. Power and water were great. Cable TV and free wifi, but the cable was pretty snowy at site 47 and the wifi went out the next morning. I called and they said they had already tried rebooting and had called Centurylink, again, nothing they had much control over. Considering it is close to I-70 it was fairly quiet, and we would definitely stay here again. We camped at Limon KOA in a Fifth Wheel. Located off the interstate, traffic was visible but barely noticeable when out side. Good for an overnight but as many KOAs on the pricey side. The couple who manages the property are top notch and there was a young man helping at the counter, making pizza and delivering to those who ordered. Water pressure was high so you will need a regulator, voltage was good despite the hot weather and all the ACs running. Cable TV and WiFi were good. We camped at Limon KOA in a Travel Trailer. Looking pretty good since our last stay a few years ago. New structures, fresh coat of pain, there is more, well-established grass etc. That said its a good place to spend the night with hookups and not much else. It seems as part of the recent renovations they added sewer to a lot of the water/electric pullthru sites of which there aren't many left. If you seriously want one of those I'd call ahead. New owner and they evidently need to get non-KOA discounts reapproved by KOA so none of that at present. We camped at Limon KOA in a Motorhome. Arrived early and had easy access to long pull through although I did have to disconnect. Close to Shell service station for fueling. It had recently rained so the ground was wet; small puddles but nothing unexpected. Owners take great care of the place. We'll definitely stay again. We camped at Limon KOA in a Fifth Wheel. As others have said, small town - at the next westbound exit you have Arby's, McDonalds and other stores; Shell fuel, Pizza Hut are close by KOA. Really not much more to say from what others have said. Sites are close. Gravel sites. Hookups convenient. Great place for an overnight stop. We will return. We camped at Limon KOA in a Fifth Wheel. There is a nice small town grocery store on Main Street. We didn't visit the liquor store (in Colorado, wine and liquor can only be sold in liquor stores). The history and railroad museum is worth a visit! This was just a one night pass through stay. It had rained a lot and there were many pot holes. The park could use a good layer of new gravel. Our site was level and good sized. We camped at Limon KOA in a Motorhome. Nice park. Owners very friendly and the spaces were great. Lots of room for rig and tow vehicle. They even make pizza on site and deliver to your front door! Very nice after long day traveling through South Dakota and Nebraska. Would stay here again. 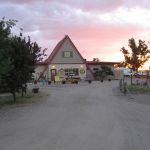 We camped at Limon KOA in a Travel Trailer. Small grocery store downtown. We were not aware of the Colorado liquor laws and finding what we wanted was difficult. McDonald's in town has RV parking. Gas station across the street from McDonalds good for gassers. (13' clearance) NAPA, tire store near campground within walking distance. Try Oscar's restaurant. The food was very good. However, the flies were there too. Not much to do there, but it's just a overnight type of park so it was ok. Easy in easy out and right off the interstate. As mentioned in the review, the pizza at the office is pretty good! They'll even deliver it to your door. Stop by Oscar's Bar and Grill for Dinner. Great kitchen, average prices for dinner and drinks. Nothing to report on the area. Southside Drink & Food on Main St a little ways west of the park entrance has great for and a large adult beverage selection. We ate mid-afternoon, the food was hot and fresh, prepared to order, and served quickly. Only stayed over night didn't do any sightseeing. Nothing to do over here. You can get diesel in downtown Limon. If you are heading west on I-80 to Colorado, and want to avoid Denver heading south, then take 71 out of Brush, CO to Limon. This positions you well to go further on to Colorado Springs or into Denver. Went to the railroad museum and park. Not much to do in Limon. There is not much to Limon but they do have a grocery store and drug store and several fuelstops. There probably are eating places as well but we did not look for them. There is nothing to do or see in Limon and is in the middle of the Colorado plains. Seems we are always in a rush so stop, sleep, and get back on the road. There are numerous fast food locations and fuel available at both the east and west exits for Limon. If you're planning on taking highway US24 down to Colorado Springs from Limon, be prepared for a bumpy ride. This highway is in very urgent need of repair. Most trees are dead so no shade. Park about half full so weren't crowded. Are you affiliated with Limon KOA ?